Eyes grow soft when gazing upon any created thing held dear. Whether it is person or place, it doesn’t much matter. Eyes grow greedy, drinking without thought of ever feeling sated. Changes are looked for and found. But soon the eye accepts the change so that what once stood out no longer becomes discernible. It will be just like this when I see those cherished faces of dear friends; and so it already is between me and this area I called home for most of my adult life. Never mind that it’s a dreary gray day where horizon disappears between sea and sky. There are no sharp clear lines today; everything my eye falls on becomes a fuzzy smudge. I know that imaginary artist line is out there somewhere, covered by fog. Even as my eye follows the white cap surf to the shore line, the sky seems to hover slightly above the churning water. There’s a closed-in stuffy appearance to my ocean view today; walking out on the cottage deck is like walking into a smoke-filled dive after a night of big business. Only the smokey fog lingers to hint to what has come before. And what was it that came before? It was on the second day that God created an expanse between waters and sky. And when the separation had come, the first creation account tells that God separated the water under the expanse from the water above it — “And it was so.” And God called the expanse sky. Today the expanse has slipped a bit, for a light mist falls out of the sky on me as I drive to pick up the morning papers and a cup of coffee. And I feel so loved that my husband would transport his work site for a few days so that I can fill my lungs with salt air and reacquaint myself with the old God in the sea. 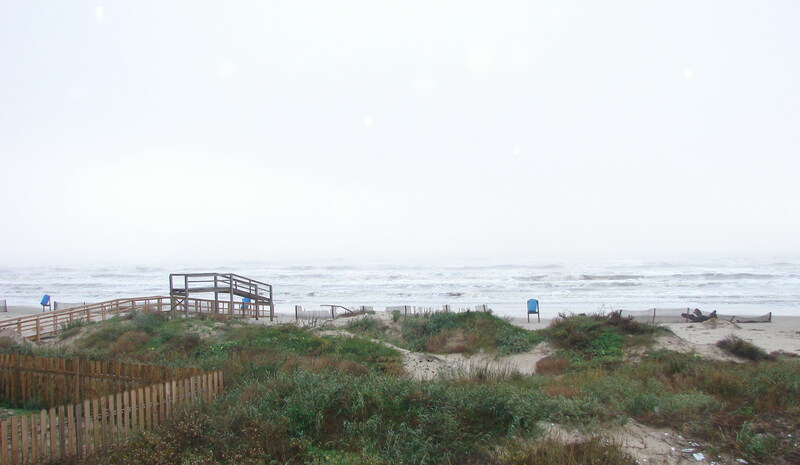 It’s time to attend to this mass of sea that blurs into expansive misty sky on this, our second day.